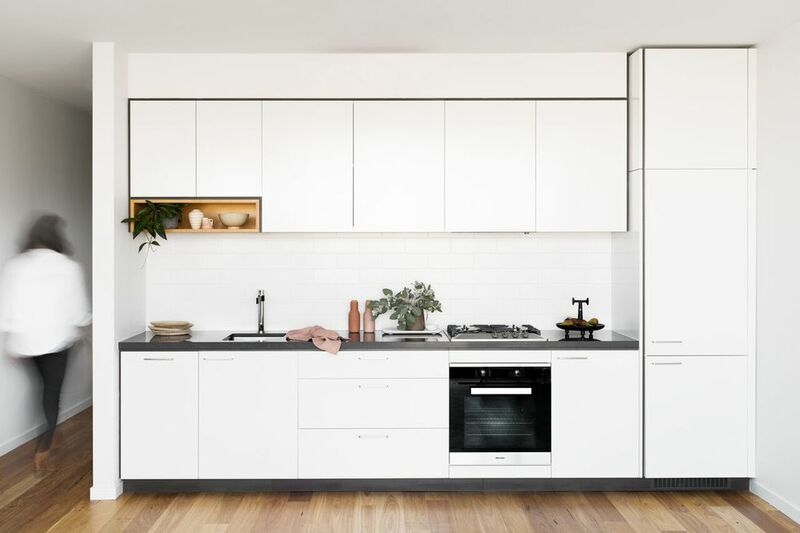 Cantilever was commissioned by Banco Group to design a functional, small footprint kitchen for a development of 6 apartments suspended strikingly above Mars Gallery, in the Melbourne inner-city suburb of Windsor. At street level, the development houses the main gallery, representing contemporary Australian and international artists. Designed by JAM Architects, the light-filled, minimalist design of the gallery space continues throughout the upstairs apartments, with floor-to-ceiling windows, light timber flooring and stark white walls. To complement the monochrome styling of the space we moved away from the soft whites of the Cantilever Kitchen Series. Instead the kitchens have a bold, contrasting palette of “Dulux Lexicon” 2-Pack cupboard fronts and dark 'grey moss' reconstituted stone benchtop from Eco by Cosentino. Integrating the Miele Fridge and Dishwasher blurs the definition between Kitchen and Living space, without compromising function in a small footprint.